Hello, Starcraft fans and welcome to a new era of TeamLiquid! 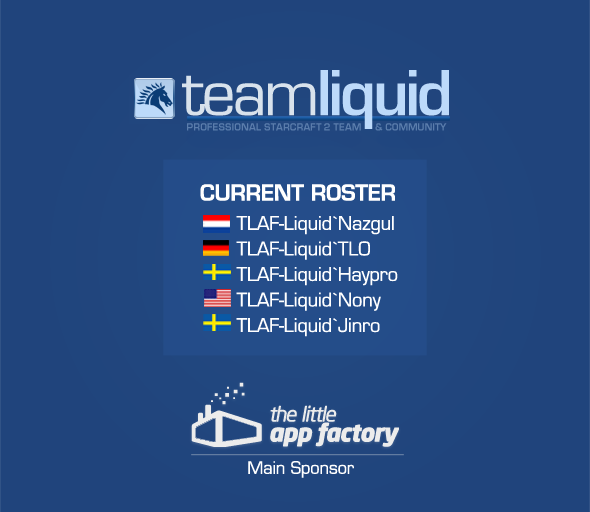 Just hours before the retail release of Starcraft 2: Wings of Liberty, TL is proud to announce that Liquid`, our home team, is now proudly sponsored by The Little App Factory. So, for the first time ever, we’re here today to present TLAF-Liquid`! There you have it, TL. The gloves are off, and Liquid` is ready to brawl. No longer just a team, but a sponsored team, Liquid` is an outfit that is preparing itself for greater things. We’d give you an introduction, but you already know these guys well. They’re from among us, and when Victor, Tyler, Jonathan, Dario and Hayder don their uniforms later this season, it's us that they're truly representing. There are teams, and there are teams, but this is our team, TeamLiquid. Our team. As Nazgul and his men clean their keyboards, uncoil their mouse chords and get ready to roll out into Starcraft 2, they do so knowing that they have a plethora of rabid SC2 fans behind them. Makers of software like iRip, TLAF made its mark on the Starcraft 2 Beta scene early on. Sponsoring tournaments and events, TLAF's Chairman Mathew Peterson is what we like to call a Playing Sponsor, a guy who not only funds a team, but funds a team because he plays the game and loves to see it played well at the highest level. In fact, here's the man himself, talking about SC2, Liquid`, and why he does what he does. "Whatever you're doing just make sure you are having fun with the people you are working with." TL: Hi Mathew, and thanks for joining us. In a few short months you've come from being yet another fan of SC2 to a sponsor of an entire team. How did this happen, and what has the ride been like? Mathew: Thank you for having me. The ride has been an interesting one, starting off with our sponsorship of the HDH and some unique showmatches. This introduced me to a number of players, and I always found that the best mannered players and individuals tended to reside in Liquid and TL.net. Once Nazgul approached me about sponsoring the team it was basically a no-brainer to say "Yes!". TL: Awesome! We've heard bits and pieces about your gaming history in other interviews, but I think now is the moment to go back and look more closely at how you went from being just another guy with a passion for E-sports to being someone who is now a major player in the most competitive RTS scene of today. Where did this journey start, and where do you see yourself and TLAF going from here? Mathew: I was always a gamer, ever since I was younger, and I've especially liked RTS and RPG. A few years ago I was part of the WoW guild Death & Taxes and that really introduced me to the passion and desire of competitive gaming. After my friend showed me SC2 I really started to notice the scene via Husky, HD and Day9 and I wanted to see more competitive play, so I suggested the idea of HDH and we had a lot of fun and success. As for the future, I'd love to remain involved in the community, but with the hassle of seeking permission from Blizzard to run tournaments, sponsoring a team and helping to nurture some hopefully great players makes a lot more sense to our company. TL: Let's talk a bit about the game itself. Given that you're a huge fan of SC2, what were some of your favourite plays during the Beta? Mathew: Haha, there were too many! Obviously I, along with nearly everyone else, enjoyed the TLO vs. Nazgul game! However, I enjoyed Whitera vs. IdrA in the HDH finals, TLO's creep harass of Strelok in the GLHF.it, Tester vs. TLO in Day9's KotB and any interesting play by others that I've forgotten. I'm also amazed by the quality of play from the likes of Tester, ITR, White-ra, QXC and IdrA. Mathew: Haha, I will happily admit that! But basically anyone who has done nifty play will win me over and TLO seems to do it in a regular fashion. On a personal note, one of my favourite moments was playing a 4v4 with TLO, TBO and my brother. Husky put up one of the videos but there were many more games with them that make me smile. TL: That must have been a ton of fun. I'm sure you just made a lot of people very, very jealous! TL: Let's talk some business now. 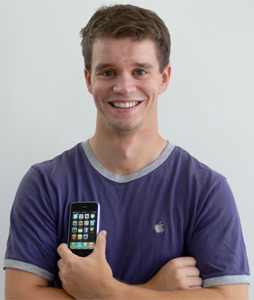 Your company makes products for Apple platforms, including OSX and the iPod/iPhone mobile OSes. You also develop some applications for Windows. How does the market for these products overlap with the general SC2 userbase, and what are your goals for TLAF in the months to ahead as it comes forward to sponsor Liquid`? Mathew: iRip, our primary product, is a tool that makes the lives of the non-tech savvy easier. As many of us tech-savvy users are often our families' technical support we believe that Liquid supporters can use iRip to provide their family with a simple and cost effective means of recovering their music in the event of an emergency. As we move forward we will continue to port more of our applications to Windows and we hope the community enjoys their simplicity and ease of use. As for Mac users, please, check out our catalogue as we believe it is one of the best when it comes to media management on the Mac! In fact, as a thank you to all the kind supporters of Team Liquid we would like to offer them a coupon for 25% off our products which will last for the entire 12 months of the sponsorship. The coupon is TEAMLIQUID and please, feel free to share it around. TL: Wow, thanks! I’m sure a lot of us will make good use of that offer. We also look forward to seeing what TLAF produces in the months to come. Moving on, let's talk a bit about Liquid`. As main sponsor, what is your vision for the team in general, and are there any specific goals you'd like to see them fulfil in the months to come? Mathew: I leave those decisions up to Nazgul and the team. All I want is for them to have fun and grow! All of the team have been invited to HDH2 and I'm really excited at their prospects. TL: OK, that makes sense. Personally though, what is your vision for Liquid` - beyond this first season of SC2, beyond this year, where would you like to see the team, say this time next year? Mathew: I'm hoping we seen a league system appear that is very similar to the one we have in Korea. If that's the case, I'd love Liquid to be one of the top 3 teams in the world. TL: Oh, we'd love that too! Finally, how about we talk a bit about the process of investing in SC2? If there was one piece of advice you could give another individual or small business interested in sponsoring SC2 activities, what would it be? Mathew: Don't anger Blizzard! Haha, but seriously, whatever you're doing just make sure you are having fun with the people you are working with. TL: Hahaha. Sound advice indeed. Well, we're ready to wrap things up, so thanks again for talking to us and of course, thanks a lot for sponsoring our team! We wish you all the best with TLAF and hope you will join us on the forums as we root for Liquid` in the weeks and months to come. Mathew: I certainly will! Thanks for having me. So yes, thanks again, The Little App Factory! Too much good news to handle, TL? Wait, there's more. With Liquid` ready to rumble and SC2 being released just days from now, TeamLiquid is proud to present a new season of everyone's favourite show! Men and women of Starcraft, please welcome back TeamLiquid Attack! After a long hiatus, TeamLiquid Attack is back with everyone's favourite host, Chill! Joined by numerous guest stars throughout the season, our renowned strategy forum mod will pit these players up against the community, letting fans like you play against your favourite players. Of course, the big news is TLO and Nony, TLO and Nony, TLO and Nony! Yes, as part of TLA this season, we're bringing you Liquid` members Tyler "Liquid`Tyler" Wasieleski and Dario "Liquid`TLO" Wunsch. You can watch them, you can play them, right here on TL! Don't miss it. Oh my, oh my. One thing’s for sure – this is just the beginning. The best, as they say, is yet to come. With Nazgul’s men out on the field and the entirety of TL behind them, there’s really only one way to go from here. Up. Hang on, TL, we're going for a ride! Looking at it now, nothing more suitable than a company with TL in it to sponsor TL. Teamliquid takes on the world! I'm not super huge on SC2 but any advance for esports is AWESOME for everyone in the community. is it bad if i saw this on facebook first? This is really awesome news Grats! nice, hope to see the squad destroy some big events. This is really awesome, and I'm happy to see someone who is actually interested in games sponsoring a team. While it is obviously also for their own benefit (HDH Invitational got them tons of views, etc. ), it feels better to have a real person sponsoring a team with their company, not some bunch of marketing gurus saying "hey, this'll be great, hyuk hyuk!". I'm sure that's a terrible mischaracterization of how most gaming things get sponsored, but this just feels more genuine to me. Congratulations! You guys are so busy lately, lol... but this is such good news.